The Stinger missile, officially known as the FIM-92A, is designed to give ground troops a way to deal with low-flying airplanes and helicopters. From the perspective of soldiers on the ground, low-flying enemy aircraft are normally a problem because they are either bombing or strafing, doing surveillance work or inserting, extracting and resupplying enemy troops. Shooting down these aircraft is the easiest way to eliminate the threat. It is a lightweight, portable weapon. The missile and its launcher weigh about 35 pounds (15 kg). The launcher is reusable. Each missile is a sealed unit that weighs only 22 pounds (10 kg). 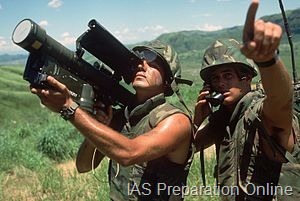 It is a shoulder-launched weapon, and one person can launch a Stinger missile (although you normally see a two-man team operating the missile). It uses a passive infrared seeker. It is a fire-and-forget weapon. The infrared seeker is able to lock on to the heat that the aircraft’s engine is producing. It is called a “passive” seeker because, unlike a radar-guided missile, it does not emit radio waves in order to “see” its target.